We, at South Florida Cosmetic Dentistry, pride ourselves on giving you the highest level of customer service and latest technology in dentistry offered today. We are always upfront with our patients and treat them as if they are all a part of our dental family. Our goal is to educate patients on some common misconceptions in dental marketing that can be misleading and not give the entire story. One such example is with the popular brand Lumineers by Cerinate. Lumineers are considered a type of porcelain veneer “smile shaper” that boasts catch phrases such as “no reduction of tooth structure (no filing down of teeth), no shots, 2 easy dental visits, permanently whitens” and many others. While these statements can have some string of truth behind them, in most cases this will not be the situation –not if you ask any top cosmetic dental professional. While the popular Lumineers can, in very few situations, be completed in 2 easy visits with little to no pain, drilling, and preparation, this is not going to be necessarily true for everyone. It all depends on the condition of the teeth, and what the best treatment scenario would be to give the best aesthetic outcome. 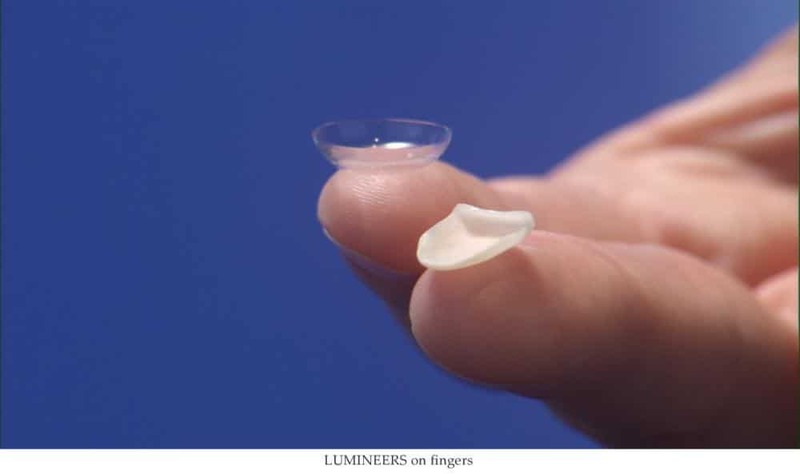 If a patient has very bulky teeth and wanted to place even the “contact lense thin” Lumineer shell over the tooth, some preparation and drilling would be necessary for the outcome to have a better, less bulky look. There are other situations where the patient would not be a candidate for Lumineers. It would all need to be determined by a cosmetic dentist. As far as the color and shade of the Lumineers, there is not a variety of color choices like traditional veneers. Veneers colors and shades are specifically selected by the doctor and the patient together so that the best result is achieved. With Lumineers, there is no variation so everyone will get the same result regardless of what the best color/shade would be for each individual person. If you look at the before and after photos featured on the Lumineers website, you will see some improvements in the look of the teeth after Lumineers have been used. I am not discrediting that they can make a change in people’s dental aesthetics; however, compared to traditional veneers and crowns, the differences are very substantial. If you look at our smile galleries and the before and after pictures, you can compare the dramatic differences in the quality of the aesthetics for our patients. We are not telling patients to overlook Lumineers as an option, we are just encouraging people to do their research when it comes to making an informed decision, and consult a dental professional that has done extensive quality veneers cases. At South Florida Cosmetic Dentistry, we offer a complimentary cosmetic consultation for our patients to come in and discuss all of their options with one of our skilled dentists. Call or email us for more details!